Is fashion really more inclusive? 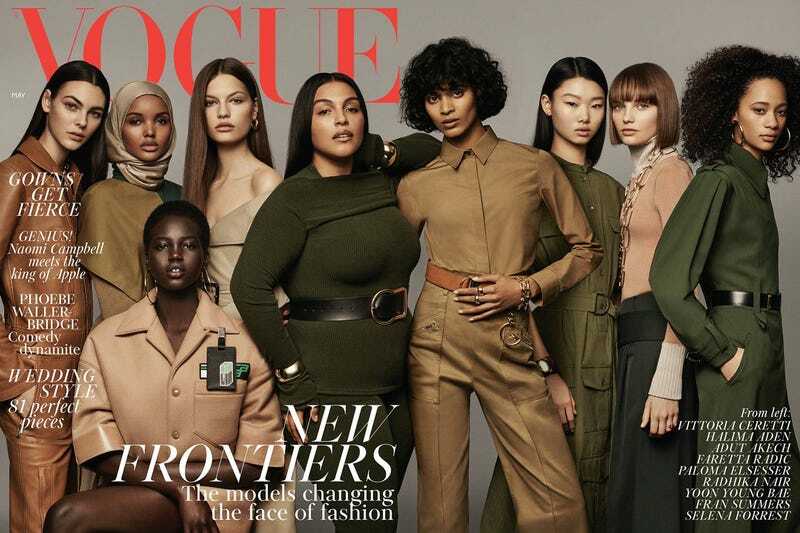 If you ask Edward Enninful, British Vogue’s first black editor-in-chief, the cover of the magazine’s May issue—featuring nine models “changing the face of fashion”—defines diversity. An impressive cast, to say the least, is featured on the bifold May cover, shot by Craig McDean, one of Enninful’s longest collaborators. The audaciously curvy and refreshingly outspoken model Paloma Elsesser (you can catch her in Leon Bridges’ new video) centers an army of beauties clad in khaki fatigues and luxury jackboots. Cover stars Halima Aden and Adut Akech, both born in the same Sudanese refugee camp in Kenya, possess the grit and the grace it takes to ascend to the heights of the modeling world. Akech has scored Valentino, Versace and YSL campaigns, while Aden was famously the first hijab-wearing model to make the cover of Allure magazine. Take a peek at either of their socially conscious Instagram accounts: Aden joined Beyoncé’s UNICEF campaign BeyGood4Burundi to eliminate the need for girls in the landlocked country of Burundi to walk miles to collect safe drinking water, a chore that leaves them open to assault and often takes precedence over schooling. Adut, born in Kenya, took the name “Mary” when she emigrated to Adelaide, Australia, at age 6. Adut told Vogue, “After I signed for an international modeling agency, I knew I would change it back to Adut. I haven’t met any other models with my name.” Smart move. There’s nothing more powerful or stylish than being yourself. All of these beauties are making black girl media magic in a way that empowers their generation to new heights of individuality.